Tom Sgouros began his solo performing career in 1985 as a rope-walker and silent clown. In 1990, he decided that our world was too peculiar to stay silent any longer. Drawing on his experience as a writer and producer of documentary films, and the experiences found by living in America at the end of the 20th century, he began performing a series of true stories, monologues accompanied by video, sound effects, slides and props. 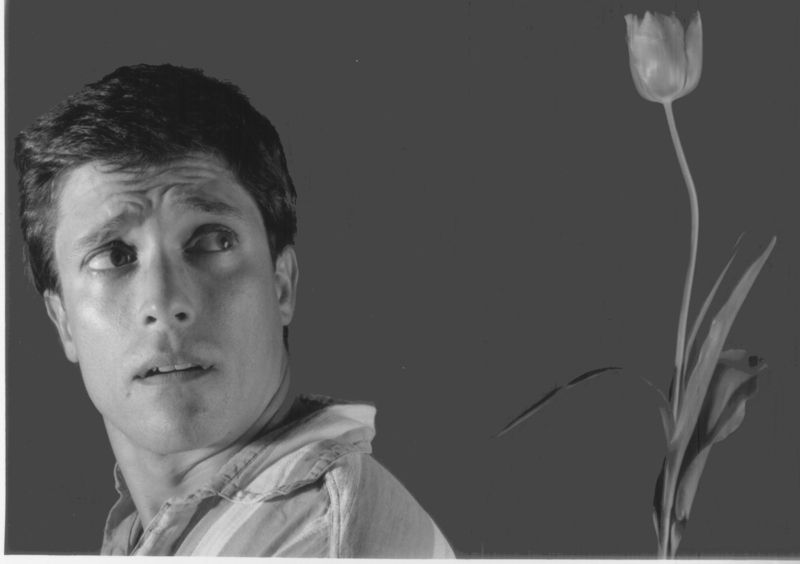 To date, he has written and performed eight solo shows (almost all of which have premiered at Providence's Perishable Theatre), including: Plastic Alligators, a modern safari through plastic swamps, including an encounter with the inventor of the pink plastic lawn flamingo; Fish, a meditation on swamps, malls, seafood, and hubris; Sludge, about sewage and French painting, an inquiry into things of value and the value of things; Liar: An Evening of True Stories, a suite of three stories concerning exploding pickup trucks, historical museums, and the lies we tell; Forget it!, a tale of northern lights, bathyspheres, canals, and the fragility of memory; and Millennium, a love story about delusions through the ages. Judy, or What Is It Like To Be A Puppet?, show number seven, features a robot Tom built in his basement, conversing with him about the nature of consciousness, free will, and which one of these two is really smart. Tom has toured North America and Europe with Judy for five years now, performing at over 50 different universities, and some theatres besides. Plastic Alligators and Millennium were supported by generous grants from the Rhode Island State Council on the Arts. Tom is the recipient (2001) of an Independent Scholars grant from the Rhode Island Committee on the Humanities for research into the misuse of scientific metaphor, and the recipient of a New Works Grant from the Rhode Island Foundation (2002) for a new show about misunderstanding, entitled "Sing Me A Song." A workshop production of this is scheduled for the winter of 2006. In the fall of 2003, Tom premiered a new show, What Do You Think? about globalization and responsibility. This show was commissioned by the University of Rhode Island Honors Colloquium. Technology for the show was provided by a collaboration with the Human-Computer Interaction Institute at Carnegie-Mellon University. Tom is also a freelance video and filmmaker, designing and producing audio and visual contributions to several theatrical productions beside his own work. He was the video designer for the world premiere at Trinity Repertory Company of God's Heart by Craig Lucas, and the premiere of Carson Kreitzer's Self-Defense at Perishable Theatre. In addition, he has developed media for productions of Samuel Beckett's Ohio Impromptu, Ping Chong's Kind Ness, Georges Dessaignes's The Mute Canary, and Kay Jenkins's Woman in a Book, among several others. He has also taught filmmaking at the University of Rhode Island, and produced short documentary works on topics ranging from solid waste recycling to the CIA, and from illiteracy to the environment around a river in RI. Tom has studied with such masters of solo theatre as Fred Curchack, Tony Montanaro, Avner Eisenberg, and Bolek Polivka. He was an original company member and the writer and producer of the Pan-Twilight Circus, a theatrical tent circus based in Rhode Island.